The 2017 Odyssey Greek Festival at St. Barbara’s Church, 480 Racebrook Road, begins today at noon. Here is a schedule of the special events. St. Barbara Greek Orthodox Church, 480 Racebrook Road, will host its second annual Taste of Greece, Saturday, March 12, 11 a.m. to 7 p.m.
Join us for authentic homemade delicacies from appetizers to desserts: souvlaki, spanakopita, pastitsio, baklava, galaktoboureko, and more. Eat in or take out. This is a wonderful opportunity to enjoy all of your favorite Greek specialties. No one does it like St. Barbara! • Greek Pastries (glyka) – Baklava (layers of nuts and filo, drenched in syrup), Kourabiedes (shortbread dusted with powdered sugar), Galatoboureko (flaky pastry filled with custard), and Ravani (moist almond and honey cake). Prices are the same as what you pay at the Greek Festival. For 34 years Saint Barbara Greek Orthodox Church has delighted the senses at ODYSSEY, A GREEK FESTIVAL with a feast of Greek cuisine. Now you don’t have to wait for Labor Day weekend! Due to popular demand, on Saturday, March 12, A TASTE OF GREECE will treat your taste buds to some of your favorites. Meet friends and family in Saint Barbara Social Hall to dine Greek style. Take home some of your favorites for another meal. 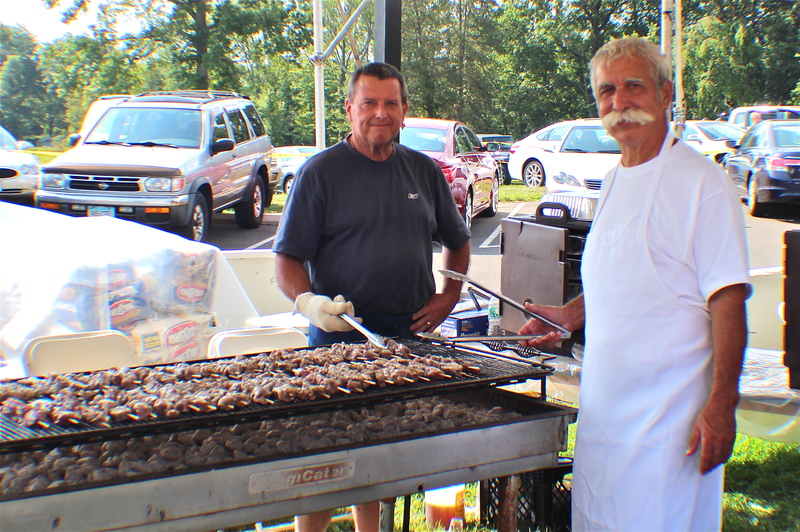 The Odyssey Greek Festival continues today at St. Barbara Greek Orthodox Church, 480 Race Brook Road. Dorothy K. Guiliotis, 77, of Orange passed away at home Monday December 29, 2014. She was the wife of George Guiliotis. Mother of Marcy Guiliotis (Jim) Winkel and Gregg Kledaras (Barbra) Guiliotis of Orange. Sister of Harriet K. (the late Walter) Kral and Patricia K. (Richard) Pacelle of Orange, Thomas C. (Joann) Kledaras of Hamden, Cally K. (Joseph) Angeletti of North Haven. Grandmother of Christopher James and Patrick George Winkel. She also is survived by her sisters-in-law Beverly Kledaras and Marina Nerris, brother-in-law Stratos Guiliotis, her nieces and nephews Richard, Kim, Wendy, Wayne, Joanne, Jay, Betsy, Maribeth, Danika, Virginia, Cally, Emma, Desi, Steven and Dean, her godchildren Kim, Marcia, Helen, Rebecca and Jennifer and her good friend Dr. Howard Pearson. She was predeceased by her parents George and Mary Papatheofrastou Kledaras, brother Stanley Kledaras and sister Georgene Kledaras. From eighth grade through her college graduation, Dorothy volunteered at the New Haven Public Library. Dorothy was a 1955 graduate of Hillhouse High School. In 1959, she graduated from Southern CT. State University with a BA in education and library science. Upon graduation, she taught elementary school in the New Haven Public School System until her retirement in 1997. During that time, she was the media specialist from 1973-1997. From 1963 until 1965 she was the Director of Higher Horizons, a Ford Foundation program. Dorothy was President and Founder of the Connecticut Campaign Against Cooley’s Anemia, running the organization from her home for 40 years. She dedicated those years to improving the quality of life of those affected by the disease. She was also co-author of multiple news and journal articles and educational pamphlets about Cooley’s Anemia. She was a co-chair of the Orange Nativity Fund that raised monies that were used to purchase a nativity that has been displayed at the Orange Fair Grounds for the past several years. A lifetime member of St. Barbara Greek Orthodox Church, she served as chapter president and grand treasurer of Maids of Athena, Sunday School teacher from 1955-1963 and was supervisor of the Sunday School from 1963-1967, Junior Goya Advisor from 1959-1963, supervisor of the Greek School and a member of the Ladies Philoptochos for 50 years. The Guiliotis family would like to extend a thank you to Homecare Plus for the exceptional care they provided Dotty while she was at home, special thanks to Fran Spagone, her aide and thank you also to Golden Hill Health Care Center, Dr. Veronica Marer and Milford Hospital for their wonderful care. The hours for visitation will take place Friday from 4 to 8 p.m. at the West Haven Funeral Home at the Green. On Saturday morning all are asked to meet directly at St. Barbara Greek Orthodox Church for funeral services at 10 o’clock. 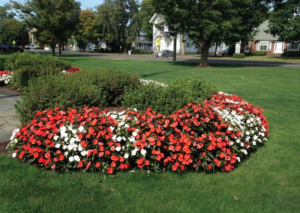 In lieu of flowers donations may be made to St. Barbara Greek Orthodox Church Building Fund, 480 Racebrook Road, Orange, CT. 06477. For online condolences please visit www.westhavenfuneral.com. It doesn’t get fresher than this. 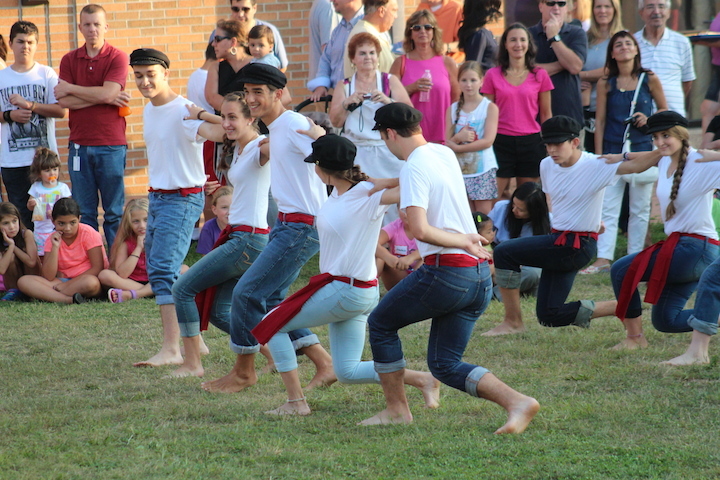 You have 3 more days to enjoy the St. Barbara Odyssey Greek Festival at 450 Racebrook Road, Orange. On Saturday, Aug. 30, the festival runs from noon to 10 p.m. Always Free Parking and Admission. We don’t want you to miss anything, so here’s Saturday’s schedule. Kids’ area – Rides, games, and magic shows. Raffle – Have a chance at winning the grand prize of $10,000 cash, or 9 additional prizes! Dads Did You Get Your Tickets For The Peck Place Father-Daughter-Someone Special Dance? Around Town, Home, Latest News, School News Comments Off on Dads Did You Get Your Tickets For The Peck Place Father-Daughter-Someone Special Dance? Peck Place School PTA is sponsoring a Father-Daughter-someone special Dance, Friday, Feb. 7 at St. Barbara Greek Orthodox Church Social Hall. The Dance is from 7 to 9 p.m. All girls who are students at Peck are welcome to bring one adult man in their life to this dance (fathers, stepfathers, grandfathers, uncles or any other significant adult man is welcome to attend). Music will be provided by Boppers. There will be a raffle and pictures taken. New this year: daisy wrist corsages and daisy boutonnieres are available by pre – order only. Each family can bring a refreshment: Girls in grades 4 to 6 bring a dessert or an appetizer (no nuts please! ); girls in grades 1 – 3 bring a cold six pack of water to share. Ticket orders were due by Friday, Jan. 31, we hope you bought yours! The Holiday Fantasy of Trees sponsored by Porch & Patio, Barnum Financial Group, The Milford Bank and ABCO The Paperman will take place at Saint Barbara Community Center, 480 Racebrook Road, Friday, Dec. 6 – Sunday, Dec. 8. The Ladies Philoptochos Society of Saint Barbara, known for their philanthropic work, is cooking and baking your favorite Greek treats for a 3-day holiday event. Enjoy the beautifully decorated Trees, Wreaths, and Urns. There will be a holiday raffle for an opportunity to win a beautifully decorated tree and take it home. There will also be great gifts for the entire family. Jocelyn Maminta of News Channel 8 will be our special guest on Saturday. Expect to be entertained by area musical and dance groups while you browse, or enjoy a piece of pastry with coffee or hot chocolate. On Saturday from 1:00 to 4:00 PM Barnum Financial Group sponsors Santa’s Village with a visit and photos with Santa. Are you hungry yet? Stop by our Greek Café for a snack or light meal of our popular Greek cuisine. And make sure to stock up on Greek pastry for your Holiday entertaining. Hours: Friday 4:00 pm to 8:00 pm, Saturday 11:00 am to 6:00 pm, Sunday 1:00 to 4:00 pm. Raffle Drawing will be 4:00 pm Sunday. Free admission and free parking. Call 203 795-1347 for more information. Come and walk around, enjoy the beautiful lights, brighten up your holiday and smile at the surroundings of the Holiday Season! Wadi “Willy” Kaoud, age 81, a 50 year resident of Woodmont, beloved husband to Rahil Jaser Kaoud, passed away on Monday, October 7, 2013 at Yale New Haven Hospital in New Haven. Born in Ramallah, Palestine on February 19, 1932, he was the son of the late Khalil Kaoud and the late Azizeh Misleh. Willy was known for his outgoing personality and sociable nature; well known in his neighborhood, he would always stop to enjoy a conversation with friends and familiar faces. Willy was well loved by all who knew him, a kind, gentle hearted man, who loved and cherished his family deeply and will be greatly missed. In addition to his wife Rahil of 60 years, he is survived by his six daughters; Samia Samander (Hanna) of Milford, Salwa Jaser of West Haven, Sylvia Abid (Malik) of East Haven, Wafia Jaser of CA, Grace Baranowsky (Frederic) of Milford and Nancy Arnold (Jay) of Orange; twenty grandchildren and five great grandchildren. He is also survived by his siblings; Abe Kaoud (Aida), Randy Kaoud (Salwa), Fuad Kaoud (Afaf) and Widad Elfar; his sister-in-law, Jackie Kaywood and brother-in-law, Joe Jaser (Sue) and many loving nieces and nephews, (including Jim Kaoud — Kaoud Rugs in Orange) family and friends. He was predeceased by his brother, Sam Kaywood and his brother-in-law Fuad Elfar. Friends and family may call on Thursday, October 10th from 4 p.m. – 8 p.m. at the Cody-White Funeral Home, 107 Broad Street, Milford, CT 06460. A Trisagion Service will be held on Friday, October 11th at 11:00 am at St. Barbara’s Greek Orthodox Church, 480 Racebrook Rd., Orange, CT 06477. The Town Plan & Zoning Commission meeting will take place at the Town Hall, 617 Orange Center Road, Tuesday, Sept. 17 at 7:30 p.m.
1. Review of the Minutes from the September 3, 2013 meeting. Report of the Zoning Enforcement Officer. Discussion on a moratorium on Production, Distribution, and Dispensaries for Medical Marijuana. *RE-ADOPTION OF THE ORANGE ZONING MAP WITH ASSOCIATED REGULATION CHANGE, – Upon the initiative of the Orange Town Plan and Zoning Commission. The Orange Zoning Map has been digitally “updated.” There are no changes to any zoning districts or boundaries. In conjunction with re-adopting the Zoning Map, it is also proposed to amend Section 383-16 – Zoning Map, of the Orange Zoning Regulations. *PETITION TO AMEND THE ORANGE ZONING REGULATIONS, – Submitted by Saint Barbara Greek Orthodox Church. To define and provide for Undertaker Establishments as a Special Use in the Residential RES District. *APPLICATION FOR SPECIAL EXCEPTION, PERMIT OR USE, – Submitted by Saint Barbara Greek Orthodox Church. The proposal is to locate a funeral home/undertaker establishment at property known as 460 and 480 Racebrook Road. A SITE PLAN APPLICATION has been submitted. *APPLICATION FOR SPECIAL EXCEPTION, PERMIT OR USE, Submitted by Barbara Thomas for property known as **350 Boston Post Road. The proposal is to locate a ‘Smoothie King’ retail store/beverage establishment with a ‘drive-thru’ service window. Also proposed is a service counter and take out service. (Sections 383-50 A., E., F., and Article XIV of the Orange Zoning Regulations). A SITE PLAN APPLICATION has been submitted. **350 Boston Post Road is the plaza in which OLA Restaurant is located, across from Fire Station #2.